Click chart to track crude oil prices. 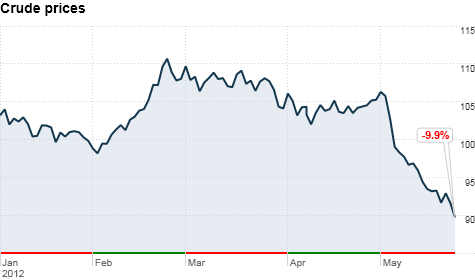 NEW YORK (CNNMoney) -- Oil prices fell below $90 a barrel for the first time in seven months Wednesday as tumult in the eurozone, excess supply and positive news out of Iran weighed on prices. Crude oil for July delivery fell as low as $89.55 a barrel, marking a 2% decline before settling at $89.90. The selling spilled across multiple commodities, with gold dropping more than $28 to $1,548.4 an ounce. "Crude prices are really dropping because of concerns about Europe and optimism about Iran," said Phil Flynn, a market analyst at PFGBest. "That's really what's driving the market right now." Adding further pressure was the Department of Energy's weekly report that showed crude supplies climbed by 883,000 barrels to 382.5 million barrels. In Europe, concerns over the future of the continent's monetary union have caused the euro to weaken, with the dollar rising to its highest level in nearly two years. European leaders were meeting in Brussels Wednesday amid growing worries that Greece could exit the eurozone, and about what effect that could have on other struggling European economies. "This concern that if Greece exits the eurozone, that's going to cause a meltdown like we saw after Lehman," Flynn said. Meanwhile, talks over Iran's nuclear program were taking place in Baghdad. Both side delivered proposals in the latest round of talks between Iran and six nations -- the United States, France, Russia, China, Britain and Germany. Western powers fear that Iran may be trying to build nuclear weapons, despite its insistence that its nuclear program is for peaceful purposes. Tehran threatened this year to close the Strait of Hormuz, a vital oil shipping lane, if sanctions were imposed on its exports of crude oil. -- The CNN Wire contributed to this report.